The Ixion Loco Conversion for Scale 7 running. Back in 1989 when the ScaleSeven Group (S7G) was first formed by the founding fathers, not only were members faced with building their own track but also their own locomotives and rolling stock. In the intervening years a great deal of effort has been expended by suppliers and the S7G committee to provide authentic track parts and rolling stock. 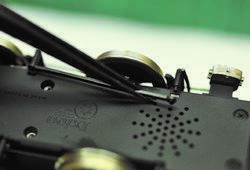 The first items were generated by Exactoscale Ltd and C & L Finescale Ltd, (who in recent months have become one company) whilst Slater’s Plastikard have covered the second. They produce a huge range of 7mm Finescale loco wheels – which can be re-profiled to S7 standards – and rolling stock wheels. They also produce a limited range of rolling stock wheels to S7 standards available to the general public and a limited range of Loco wheels (driving, carrying and tender) to S7 standards available only through the S7 Stores. A service by members of the S7G exists for re-profiling wheels for those who do not have turning facilities. Despite all this effort we were, until recently, still dependant on the scratch- and kit-built market to provide our motive power and this placed a burden on those who have less time or skill to build S7 locomotives. Seven or eight years ago Ready-to-Run 7mm (O Gauge) models started to appear and then about two to three years ago suppliers such as Richard Webster of Lionheart Trains with his “Super 0” models started to produce RTR locomotives (albeit often at a cost in excess of £1000) and wagons with S7 wheels as special orders. We have come a long way in the past 25 years but in these austere times we still need to watch those pennies, so it was with great interest I examined two Ixion models. This company have to date produced two locomotives that retail at around the £299 mark which is both excellent value for money. 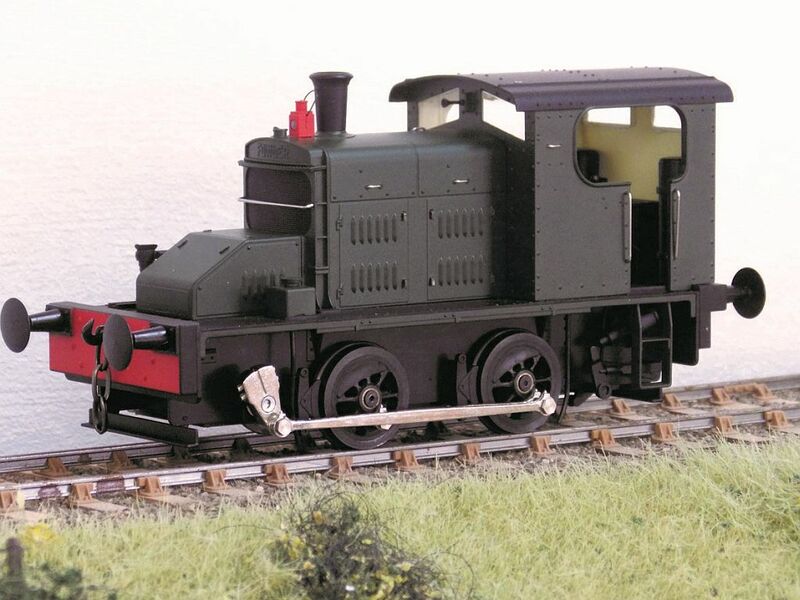 However its gets better as Dragon Models have both models on offer at £225 and with only simple hand tools they can be further embellished to improve their appearance but also and most importantly they can, in a couple of hours, be modified to run on S7 track! How I did this is the purpose of this article. The photographs in this article are thumbnails, with restricted size for readability. To view the full size photographs please visit the appropriate gallery in the 'Showcase' section. The two locomotives in question are the Ixion 0-6-0 Hudswell Clarke saddle tank and the recently introduced Fowler 0-4-0 Diesel Mechanical GWR No 1. Photo 1 - The Ixion Fowler 0-4-0 DM locomotive. The process of conversion requires very few tools, a modicum of skill and can be accomplished on the ubiquitous “kitchen table” in a couple of hours. The process can be best described in pictures, which I am told are worth a thousand words – this should make the article easier to follow. You will need to purchase in both cases a new set of wheels and 1/8” S7 axles from Slater’s at a cost of around £25 (inc. VAT) per axle. The wheels will need to be turned to an S7 profile which adds a further £30 or so to the cost, but the end result is an S7 locomotive that costs around £300 and that is certainly progress and a real benefit to everyone. Once you have the locomotive of your choice you need to start the process by purchasing the wheel sets and axles. For the 0-6-0 Hudswell Clarke these are three sets of Slater’s 7837WT 3’1” 10 spoke (1/8th axle) (Wantage Tramway) wheels. 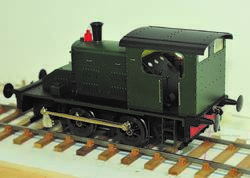 For the Fowler 0-4-0 Diesel Mechanical GWR No 1, you will require two sets of Slater’s 7836F 3’ 0” 8 spoke (1/8th axle) Fowler Diesel. 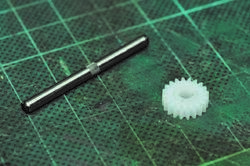 You will also need to order Slater’s X720060S 1/8” Driving Wheel Axle for S7.The wheels cost £20 per axle (£16.67 excl. of VAT) and the axles cost £4.83 per axle (£4.02 excl. of VAT). Of course you should be able to reduce this with the 10% S7G Slater’s discount. Either set will need to be re-profiled to meet the S7 standards. 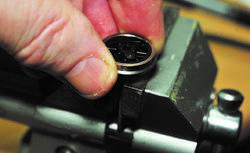 This can be done using an S7 profiling tool mounted in a small lathe if you have the equipment and skill. Alternatively they can be sent to Chris Makepeace at 5 St Aubyn`s Villas, Tiverton. Devon. EX16 4JB, or Colin Dowling 44 Marnington Avenue, Rochford Essex SS4 1DN, both of whom offer a re-profiling service at a reasonable charge. This process usually takes about two to three weeks and is by far the least stressful solution. If you chose the latter, you can save a little time by arranging for Slater’s to send the wheels direct to either Chris or Colin. Whilst having the wheels profiled it is an ideal time to have them chemically blackened to improve their appearance but this must be requested as an extra. Having purchased the axles for each locomotive these automatically generate the required “Back to Back” measurement of 31.2mm. 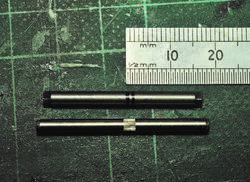 Whilst ordering the wheels and axles for your chosen locomotive I also suggest that, if you do not have one already, you order the 0.89 mm A/F Allen Key (Slater’s Part No X78003). This is required to secure the wheels and is so small that it is rarely featured in any of the standard Allen Key sets. We now need to collect our tools and there are only two critical items required: 1/8” parallel reamer and sharp centre punch. Other general items required are: No 0 Cross blade screw driver, 10 BA box spanner, 10 BA tap, fine file and good pair of general purpose pliers. 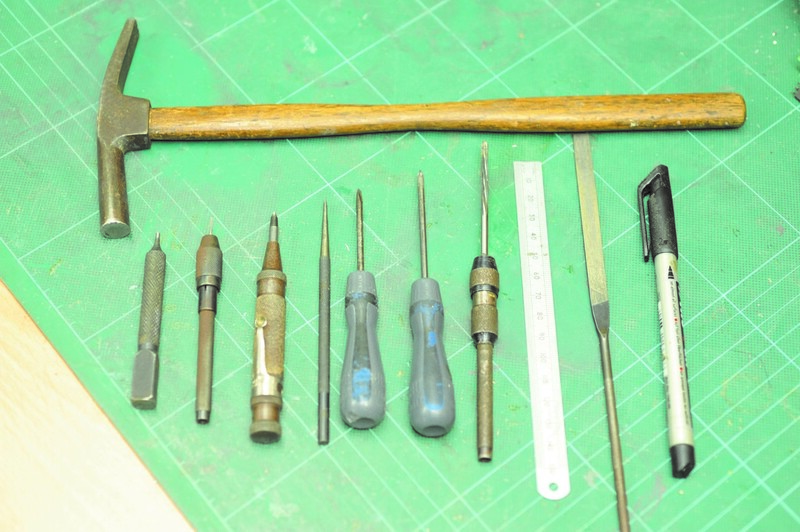 Photo 2 - A basic set of tools is required. In addition a number of other useful, but not essential items, such as a marker pen, ruler, and pin hammer are also shown. Not shown is the small bench vice which will be clamped to the table. It might also be useful to have some Loctite Retainer to hand. Both locomotives are treated in exactly the same manner but most of the photographs relate to the Fowler Diesel as this locomotive is slightly more involved and includes balance weights. The only real difference is that the Hudswell Clark has a third axle in place of the counter balance shaft. 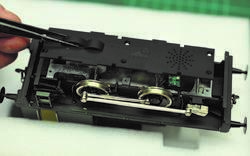 Remove the locomotive carefully from its packing and then remove the bottom piece of white packing foam from the box. This is to be used as a support stand during the conversion process. Invert the loco and place. Photo 3 - The inverted loco, supported by the white foam. 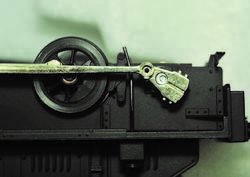 Carefully remove the two brake rods from each side by easing each end and/or middle towards the centre line of the loco and set carefully aside. Photo 4 - Removing the brake rods. Photo 5 - Removing the rods using the box spanner. and set aside. 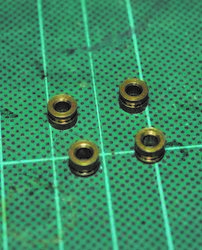 Take a careful note of the assembly order, the screw shoulders/lengths and the spacer washers. 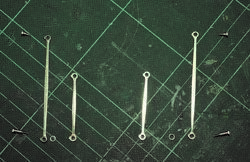 Photo 6 - The rods, washers and screws. (In fact I completed this stage after I had removed the keeper plate and wheel set, (as some photos show), but with hindsight it`s much simpler to do it at this earlier stage). 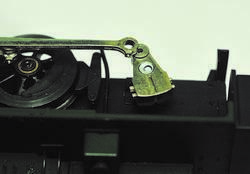 Once all the connecting and drive rods have been removed and stored then remove the six small black screws from the keeper plate. Photo 7 - Removing the retaining screws from the keeper plate. Now carefully remove the keeper plate without disturbing the axles. Photo 8 - Removing the keeper plate. Before removing each axle note that the small shoulder of each bearing faces the outside of the cast frames. In addition I marked each bearing with the marker pen so that they could be returned to the same housing when re-assembly took place, but as this is a production model I doubt whether it is really necessary, but it is better to be safe than sorry. Photo 9 - Note how the bearings are fitted, before removal. Now with care, place each wheel set in the smooth jaws of the vice and firmly tighten to grip the axle, now gently rotate each wheel to break the grip and then remove it from the axle by gently turning and pulling at the same time. Photo 10 - Removing the wheels from the axles. It is necessary to take off all the wheels to remove the bearings from the axles without damage, as there is a knurled section in the centre of each axle preventing the bearings being slipped along the axle. Photo 11 - Showing the knurling in the centre of the axle. Once all the bearings have been removed set them aside. Photo 12 - The bearings, after removal. The final disassembly process is to remove the nylon drive gear. This is done by placing the axle shaft loosely between the vice jaws which are set between 4 and 5mm apart with the gear wheel on top of the jaws. Photo 13 - The drive axle set between the vice jaws. Do not open the jaws of the vice any further or you may distort the gear wheel. 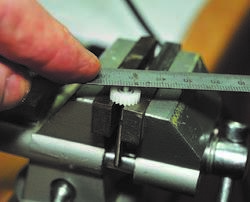 Gently apply downward pressure with your fingers and a hard flat object such as a ruler until the shaft moves and the axle end becomes flush with the top side of the gear wheel. Photo 14 - Removing the axle from the gear wheel. 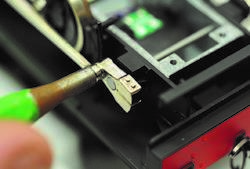 Using a parallel punch that is less than 2mm in diameter at its tip, gently tap, or preferably push the end of the axle until it falls free of the gear wheel. Photo 15 - Final removal of the axle. The result of this is shown in photo 16. Photo 16 - The drive axle and gear wheel are separated. Your selected locomotive is now fully dissembled and awaits the rework process. At this point we need to use the 1/8” parallel reamer. These can be bought from a number of suppliers such as Tracy Tools (www.threadtools.com) or Squires; both also keep 10 BA taps. My own reamer came from RS and is part No 696-702 and seems to be about £19.00 at the moment. Photo 17 - The 1/8" parallel reamer. Please don’t be tempted to purchase cheap tools, in this case accuracy and sharpness are important and good tools last a lifetime. Furthermore both items are much easier to use when mounted in suitable pin-chucks, which are available from the same sources. 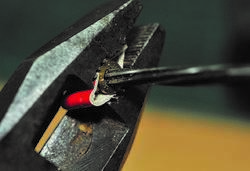 Taking each bearing in turn hold it in the jaws of a pair of general purpose pliers but, first, line the jaws with a scrap of cardboard to avoid damaging the bearing’s external surface. The existing bearing hole is 3mm, which is 117.5 thou. The replacement Slater’s S7 axle is 1/8” or 125 thou so we have to remove 7.5 thou. This is an ideal task for a reamer and is simply accomplished by offering it up to the bearing and gently rotating it whilst a slight forward pressure is being applied. 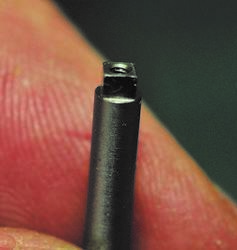 Do not press too hard, let the reamer do the work and let the existing hole act as a guide. The task takes less than a minute to complete so be patient. Photo 18 - Reaming the hole in the bearing. (If you have a lathe then please use it to ensure absolute parallelism of the bore, but it is not necessary and I have now successfully completed six locos all by hand). 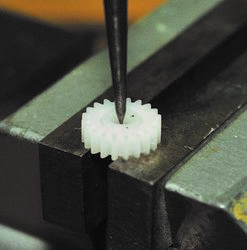 When you have completed all four bearings you also need to ream out the centre of the gearwheel, but this, being nylon, requires a little more care as the material is much softer. 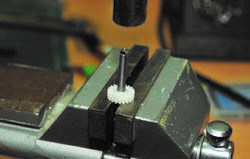 Start by placing the gear wheel flat on the bench top and holding the reamer vertical and rotating the reamer slowly, constantly checking verticality. When almost through, hold the gear in your fingers to finish off the process. Photo 19 - Finishing reaming the gear wheel. Now set the wheels and gear apart and pick up one of the two Slater’s axles and examine the ends. These usually have some “machining flash” on the square boss that must be removed. Photo 20 - The Slater's axle, as delivered. First remove the two screws and set them aside in a safe place. Holding the axle pass the fine file over the outside edge of each of the four faces. A couple of strokes are sufficient to produce the result shown. Photo 21 - The reworked axle end. Re-working each end of all the axles in this way is recommended by Slater’s and will ensure an easier assembly. Next we need to address the wheels. Similarly de-burr the inside edges of each of the square holes using a sharp scalpel. 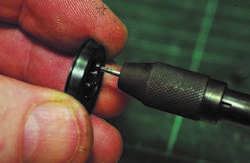 Now using a 10BA tap held in a pin-chuck tap each of the crankpin holes from the outside of each wheel. Again lay the wheel flat on its back on a flat surface and check the verticality of the pin chuck carefully during the process. Hold the wheel between the fingers only when tapping the last few turns of the thread. It is important to make sure the mounting holes are at right angles to the wheel face. Complete all four wheels, (or six wheels in the case of the Hudswell Clark), in this way and then set them aside. Photo 22 - finishing taping the crankpin hole. Now select one axle and mark two rings around the circumference, one 15mm from one end and the second 16.5mm from the same end. The dimension is not too critical but should be within 0.25 mm and can be measured with a good engineers steel ruler. Photo 23 - Measuring and marking the Slater's axle. As a guide, place the old axle alongside to make sure the marks line up with the knurling on the original axle. Set the vice jaws so that they are only 2mm apart and rest the marked axle across the gap. 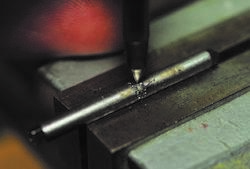 Using a sharp centre-punch stamp a minimum of ten pop-marks around each of the rings previously marked out. Ideally offset the two sets of pop-marks to provide the maximum interference between the gear wheel and shaft when it is fitted. Photo 24 - Pop-marking the Slater's axle. The object of this exercise is to deliberately raise burrs on the axle so that the driving gearwheel has a good purchase. There is no point in using any Loctite or other forms of adhesive to ensure this happens as I do not know of any adhesive that will glue nylon to steel. Clearly neither does the manufacturer of the locomotive as they too rely on a “knurled band” on the axle to secure the gear wheel. If you have a lathe and a small knurling tool you too can produce a similar band on one of the Slater’s axles, but once again I have now modified six locomotives and none has shown any signs of a problem following this procedure even after extensive running. Once we reach this stage we need to install the gear wheel in the right place on the axle and this is best done by trial and error. Open the jaws of the vice to about 4mm and lay the gear wheel across the jaws. Place the prepared axle vertically above the centre hole and lightly tap the axle until the punched burrs reach the gear wheel face. 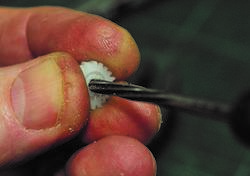 Continue tapping until the first ring of burr holes slide into the gear wheel. Photo 25 - The new drive axle being fitted into the gear wheel. Take the axle and fit two bearings one each side with the thin shoulder outermost in each case. Once the bearings are fitted then lay the axle into position within the loco frames and centralise the gear wheel within the cast gearbox housing and note how much of the axle extends beyond each of the two frames. There should be an equal amount protruding on each side. If this is not the case then return the gear and axle to the vice jaws, and gently tap the axle a little further to equalise the protrusions. Repeat this process until the gear is central in its gear housing and the axle protrudes an equal amount on each side of the frames. Note that tapping the axle very lightly a large number of times is much more preferable to one or two hard taps which may result in positional overshoot or even the splitting the gear wheel. Correcting this will inevitably result in the gear becoming loose at a later date. Also note that the gear is not centrally located on the axle. Remove the bearings each time you repeat the process, so that you do not lose or damage them in the process. 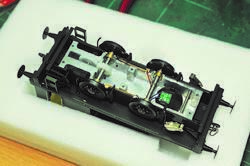 Load each of the axles with their respective bearings ensuring that the thin shoulder is on the outside in each case and then refit each of the replacement wheels in turn. Photo 26 - The bearings fitted onto the new axles. Note that one wheel crank pin mounting will lead the other wheel on the same axle by 90°. The beauty of using these Slater’s axles is that the quartering is fully automatic and sheer simplicity. The only thing to remember is to assemble the second axle with the wheel on the same side similarly leading. Replace each of the axles into the cast frames. Make sure that the phosphor-bronze pick-up wipers touch each wheel by gently tweaking them if required before installing each wheel set. Remember that the wheels are now a millimetre or so further apart. Now replace the keeper plate and refit the six retaining screws. Photo 27 - The wheelsets installed into the loco. 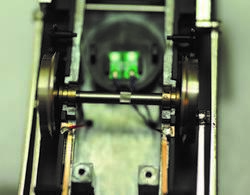 We now turn our attention to the imitation drive axle (Lay shaft) and its counterweights. First holding one of the weights gently twist and pull the other until it comes off the Lay shaft. Withdraw the Lay shaft from the frames. Hold the Lay shaft firmly in the vice jaws and remove the second counter weight. Now take two 14BA washers and place them in the hole of one of the counterweights and refit to the end of the Lay shaft. Thread one of the 8BA steel washers over the Lay shaft (Photo 31) and re-install the assembly to the locomotive frames adding the remaining 8BA washer to the protruding end of the lay shaft. Photo 28 - Refitting the counterweight to the lay shaft. Place the two remaining 14BA washers in the shaft mounting hole of the remaining counterweight and refit it to the Lay shaft. Press firmly home by squeezing the two counterweights together between finger and thumb to ensure they are securely in place. A single drop of Loctite 480 will be found beneficial to secure the counterweights in position on the axle. Personally I do not recommend the use of super glue, as this has been found to attack some plastics in the long term, though I do know that some conversions have been done in this way! 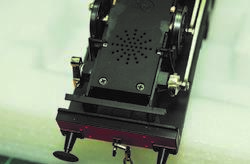 Each of the 14 BA washers is forming a packing piece 0.25 to 0.3mm thick and along with the 8BA steel washers which are 0.5mm thick and together they set the two counterweights the correct distance apart to match the Drive and Connecting rods. The final stage is to re-install the Connecting and Drive rods. Refit one complete side only, using the reverse of the procedure used during dismantling. Take careful note to refit the correct 10 BA Hexagonal headed, shouldered screws into the correct holes along with the spacer washer on the rear driving wheel. Do not over tighten the screws. Remember they are only going into a fine plastic thread. Check assembly by ensuring there is clearance for the moving parts to pass each other. 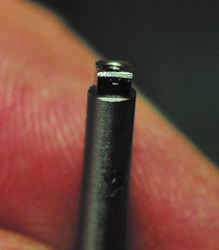 Do not use any thread locking compound, the plastic will ensure the bolts do not work loose. Photo 29 - Ensuring clearance in the moving parts. 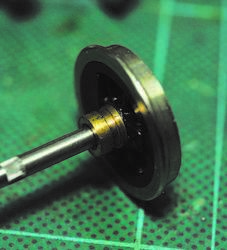 Turning to the second side and again using the correct shouldered 10 BA Hexagonal headed screws, fit the Connecting rod and Drive rod to the two wheels, but do not secure the Drive rod to the counterweight yet. Make sure that you fit the spacing washer on the drive wheel before adding the Drive rod. 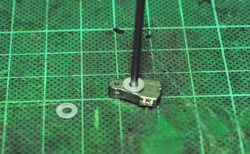 Finally, gently rotate the balance weight on the lay shaft until the tapped hole lines up centrally with the bearing hole in the end of the Drive rod and insert the final Hexagonal headed shouldered screw. Photo 30 - Adjusting the balance weight on the lay shaft. Photo 31 - The parts are now aligned and ready for the hex-headed screw. You now have a fully converted S7 Ixion locomotive for your layout, ready for minor titivation, painting and weathering if you wish. Photo 32 - the converted loco. My thanks must go to Rob Thompson and Andrew Campbell who lent me their locomotives to undergo the conversion process. All that remains now is for me to write up the procedure for converting the Lionheart 38 and the Auto Coach to S7, so watch this space.